We are proud to announce the First INFRAMIX Workshop, organized at the Automobile Barcelona Fair, in its 100 edition! The workshop is designed to be very participative so be prepared to share your thoughts about these subjects and many more! It will also be a valuable opportunity to meet relevant stakeholders and be part of a wide network of experts in the sector. The participation in the workshop will be under invitation, so let us know your interest (mailto:info@inframix.eu). Also, contact us if you have any question. Please, save the date so you can join us and participate in our discussions.A final agenda and more information will be published soon. 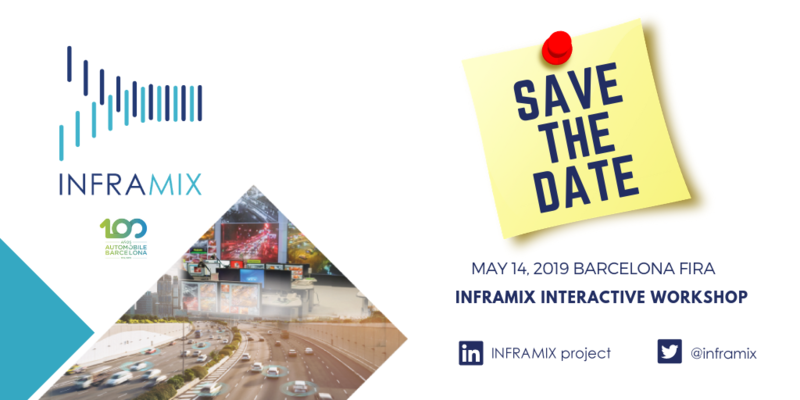 Keep updated in this page and also in Twitter (https://twitter.com/inframix) and Linkedin (https://www.linkedin.com/showcase/inframix-project/).